BATON ROUGE, LA (WAFB) - Many people have set aside time and effort to honor the law enforcement officers killed in the summer attack in Baton Rouge. That includes one woman who made sure family members had a book of memories that would last a lifetime. When Sue Hilliard heard about the ambush killings of three officers on Airline Highway, she felt compelled to help. "Just, I care," Hilliard said. "It helps to help others. And if God gives you a sign, you really need to obey." That's why she created a scrapbook for the family of each victim. It is filled with news articles about each officer. 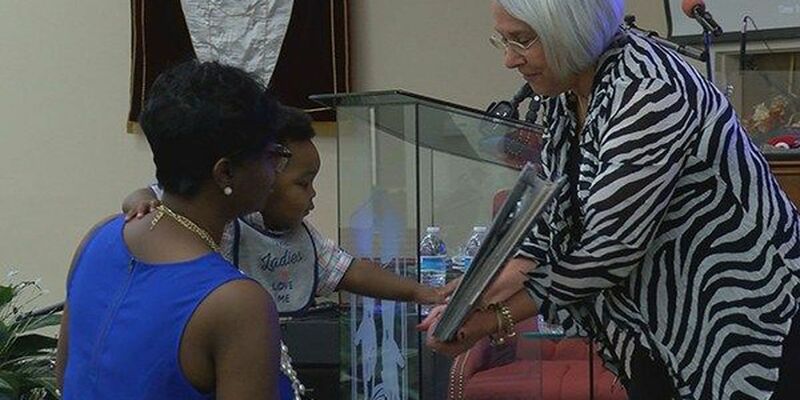 She presented one of those books Sunday at the Star Hill Church on North Foster Drive to the wife and son of Officer Montrell Jackson. The ceremony included a handful of guest speakers, including former LSU head football coach Les Miles. He said he was in a state of shock on the day of the shooting. "I just didn't believe that that represented our community," Miles said. "Certainly, it didn't represent this event. Everybody that came here was proud to be from Baton Rouge. Everybody that came here enjoyed the direction of our civil leaders." Mayor Sharon Weston Broome also spoke and poets with the Writers of America Club shared their writings on the role of a police officer. "By nature, we're just so selfish," said Crawford Wheeler II with Writers of America Club. "And we don't think about others. So to me, to go out and knowing that you're putting yourself in danger every day, where that's just expected. That's something that just amazes me." Deputy Bruce Simmons, who was injured in the ambush attack, also attended the event. Both he and Montrell Jackson's family declined interviews.